Liverpool, UK (BBN)-A little-known picture by the Pre-Raphaelite artist Dante Gabriel Rossetti is going on public display for the first time this week, 135 years after it was painted. 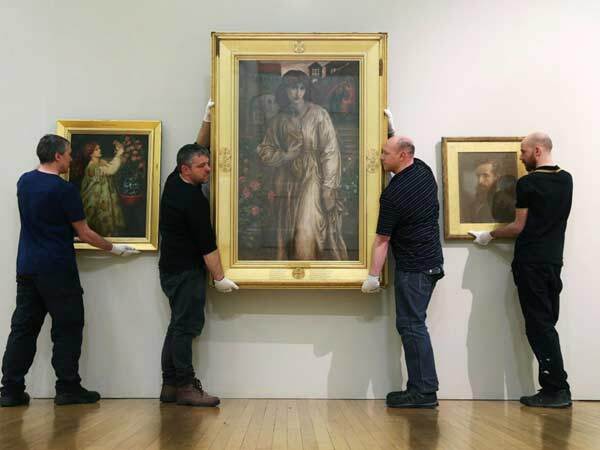 The Salutation of Beatrice is a late addition to an exhibition opening at the Walker Art Gallery in Liverpool on 12 February, which will explore the support that the city and local patrons gave to the Pre-Raphaelites, reports The Independent.co.uk. Ann Bukantas, head of fine art at National Museums Liverpool, said that, with a movement as popular as the Pre-Raphaelites, it was rare to find pictures that had not been exhibited. “The painting is part of filling in the gaps of the Rossetti story, the same way our exhibition is filling in a gap in the way the Pre-Raphaelite story has been told,” she said. The Salutation of Beatrice (1881-82), painted shortly before the artist’s death in April 1882, illustrates lines from the second sonnet in medieval Italian poet Dante Alighieri’s Vita Nuova (New Life). It depicts Rossetti’s muse Jane Morris, wife of the Pre-Raphaelite painter William Morris, as Beatrice Portinari, the subject of the poet’s unrequited love. The spurned Dante is in the background. The painting belonged to Rossetti’s friend and patron Frederick Richards Leyland, a ship owner and art collector from Liverpool, and is now owned by Leyland’s descendants.